Videos of BJJ techniques, competition, sparring, drills and exercises. Have you ever heard of a BJJ instructional suddenly gaining 2 hours of bonus content at no extra cost? Now you have. Don’t own it yet? You can buy Mastering the Crucifix or save money by bundling it with Jeff Rockwell’s Sit-Up Escape System. Get 10% using coupon code RELAUNCH. The digital nature of Artechoke’s cloud instructionals let’s us do cool things like this. I have a few more additions I plan to make to Mastering the Crucifix later this year. Let’s take a minute to talk about how cool this is. We’re doing things with BJJ publishing that haven’t been done before. Marshal is a writer who loves books, but he’s also forwarding-thinking and sees that the future of publishing isn’t made from dead trees. Some time I’ll make him talk about his work to implement a digital distribution model for college textbooks. He was working on ways reduce textbook prices and save college students from being ripped off like they are today. 3-D Jiu-Jitsu was Marshal’s proof of concept. He wanted to know if people would “get” what he’s trying to do. Explaining what makes this different than traditional BJJ instructionals has always been our biggest challenge. Is it a book, a DVD, a BJJ subscription site, a digital download? Today I went through all of Mastering the Crucifix and added up the run time for all its videos. If we released those on DVDs, it would be over 3:30 hours long. Most companies would have split that across 4-6 discs, call it “The Crucifix Trap System: The Black Belt’s Secret to Punishing Any Opponent with Crippling Submissions” and pushed for $175 pre-orders . The price needs to be that inflated so they can pay the 50% affiliate fee to guys who hype it on social media and e-mail lists. If we published it as a paper book, it would be as big as anything Victory Belt put on book shelves, back when they were into martial arts instead of CrossFit. If it was in the app store, we’d have to split it into six separate $30 apps to get around the file size limits, like BudoVideos does with their DVDs. The point I’m making is the Mastering the Crucifix is a big product by any traditional standard, and we went to the trouble of combining all of them in a new way, even adding multi-angle looped demonstrations not seen anywhere else. I hope you think it’s cool too. Tell a friend if you do. Remember, Artechoke members have access to the private Artechoke Open Mat group Facebook to ask questions and get answers from authors like me. Find the link in the sidebar after logging in. Lately I’ve been lucky enough to train with Nelson and Hillary, the black belt couple behind Inverted Gear. We got together and shot technique videos for the Inverted Gear YouTube channel, including two on my favorite position, the crucifix. As a gift to fans of Aesopian.com, Nelson and Hillary hooked me up with coupon code AESO for 15% off coupon code for InvertedGear.com. I’ve been a fan of their gis since back when they first started (here’s my video review from a few years ago) because they make tall/slim models in my size so I am very happy recommending you pick up one for yourself. In this video, we go over two ways to deal with the annoying “1/4 guard,” or whatever you call it when you’re almost in mount but your foot is still stuck. The first method is the rolling back take or twister roll, as made popular by the likes of Eddie Bravo and Ryan Hall. The second technique is a decidedly simpler solution. The friend I talk about in the second half is Jack Taufer, a black belt under Dave Kama in the Rickson Gracie lineage. You may have seen Jack on Budovideos.com’s TWIBJJ series or his video threads on the UG (links below). Jack is raising funds to support his nephew’s mother as she fights cancer. Please consider sending a PayPal donation to jacktaufer@hotmail.com. You can learn more about Jack on the Kama Jiu-Jitsu website. He is available for private lessons at Rickson Gracie Jiu-Jitsu Laguna Niguel and seminars anywhere you want to fly him. Georgette Oden wrote a glowing review of one such seminar. Thanks to Jeremy for teaching the first half of this video. Jeremy is the owner and head instructor at Zombie BJJ in Allentown, PA, where I train and teach too. 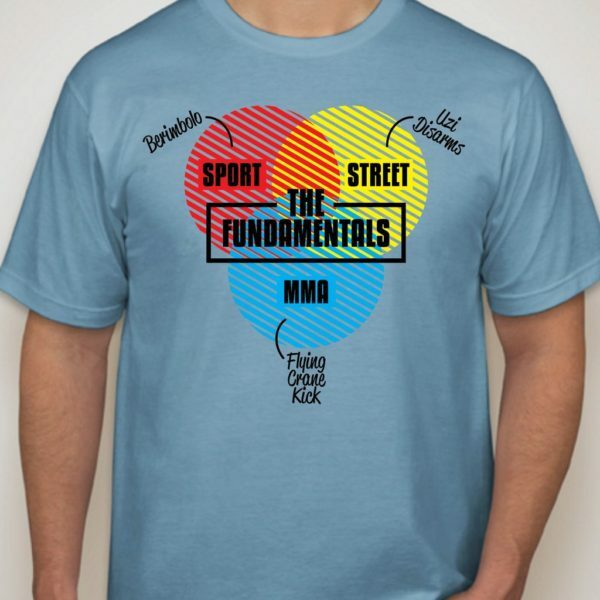 If there’s interest, I can talk in more depth about the topics of simplicity vs complexity, depth vs breadth, individual style vs school/lineage style, refinement vs experimentation, body mechanics, postural alignment, etc. Jack is on a kick of filming requests too, so I’ll see if I can get him to share his thoughts too. Let me know with your comments or by sharing on Facebook! 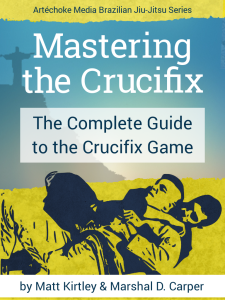 Mastering the Crucifix is Live! Did You Get It Yet? My big crucifix and reverse omoplata instructional is now out at ArtechokeMedia.com! Buy your copy for $39.95 or read an entire chapter for free first. So what do we call this–book, e-book, video, website, or what? It has written explanations, multi-angle animated GIFs, and video instruction. You can access it as a responsive app-like website on any modern device with a web browser. You can download it in ePub format for your e-reader. You can ask questions on any page to get feedback directly from the author. It’s the Swiss Army knife of BJJ instructionals. If you backed us on Indiegogo, you should have received an email with your login credentials. Let me know if you didn’t or you had problems. You can log in anywhere on ArtechokeMedia.com or within Mastering the Crucifix itself. Now that I’m no longer spending all my time working on getting this out, I’ll get back to updating my site and podcast. Expect behind-the-scenes looks at what it took to get ArtechokeMedia.com up and running (I did all the web development) and previews of upcoming projects. Buy Mastering the Crucifix now. Functional Half Guard is back up on YouTube. Despite being filmed by two Estonian white belts back in 2006, it’s still one of the best instructionals on half guard fundamentals. The description on YouTube contains the table of contents with clickable minute markers. Enjoy! Want more free full length BJJ instructionals? Check out 3-D Jiu-Jitsu: An Introduction to Thinking Conceptually. Like that new multimedia e-book format? Pre-order my crucifix instructional. Dug this out of the Youtube vault. Shot at Gracie Barra Clearwater in FL. Watch with Youtube annotations on to see links to related guard pass videos by the Mendes brothers and Andre Galvao. Be sure to subscribe to my Youtube channel to get all the new videos lined up this year! Contact me if you’re interested in setting up a BJJ seminar in 2014!